Instance quests are an important part of instance leveling on World of Warcraft, and it is entirely too easy to forget about them. Just about all of the instances in the game of WoW will have quests that can be completed inside of them, so why not double your effort and get several things done while you’re soaking up all that experience from instance leveling? One of the most effective ways to use your time while instance leveling on WoW is to queue for random instances while you are traveling from play to place to collect your instance quests. DPS classes will be able to gather up a lot of the instances quests this way and still get to enjoy all the benefits of instance leveling, although healers and tanks may need to set aside some time to travel around and pick up the quests. With the exception of a few instances that only have quests that for either Horde or Alliance, there are generally quests for the instances you end up in. 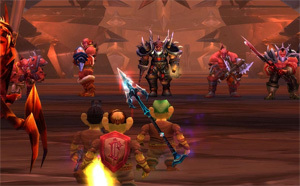 The best way to go about collecting your instance quests is to figure out which instances you are likely to pull first through the dungeon finder, and then head off in the direction of the entrances to those instances. In most cases, you will find the quest givers for the instance quests in the cities that are nearby the instance. However, in some cases you will need to complete some prerequisite quests before you will be eligible to pick up the instance quests. This is why having a good instance leveling guide like Dugi’s Dungeon Leveling Guide is really a great idea. If you land in an instance before you had time to go pick up the quests for it, you can always ask your other party members to share the quests with you. In general many of the instance quests are shareable, except for the ones that have prerequisite quests you have not completed yet. Many players will automatically share their quests for the instance you are in, and others will share the quests if you only ask. By the same token, make sure that you share your quests for the instance with your party members. This is a common courtesy that will make the entire instance leveling experience even better for everyone. Many World of Warcraft players who’ve been playing for years have never experienced the loer level dungeons, which means instance leveling has opened up a whole new area of content for them. That being said, they probably have not completed the instance quests, either. This means that leveling a character is now like playing entirely new content instead of repeating the same old quests over and over again. Even players who have not been playing WoW for a long time will appreciate the many benefits from instance quests, which include better gear and more experience than solo quests.